There is a joy to giving and it is encapsulated in St Francis of Assisi‘s time lasting quote “For it is in giving what we receive”. There is a particular joy to giving something of ourselves when that gift is needed and appreciated by another. All of us have the very human need to be understood – not the words we speak but the essence of who we are. We would also all agree that “The most basic of all human needs is the need to understand and be understood. The best way to understand people is to listen to them” (Ralph G. Nichols). 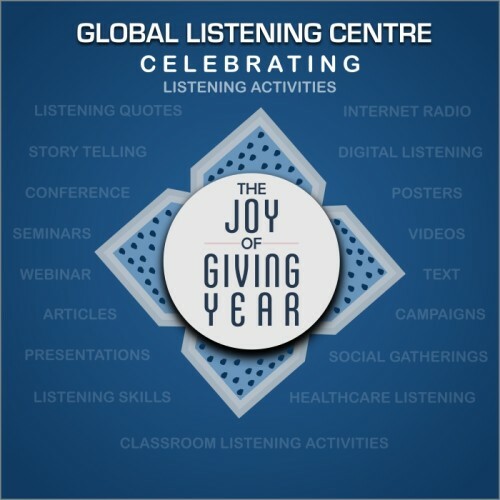 The Global Listening Centre celebrates the Joy of Giving this year: we need to remember that true and effective listening is one of the most valuable gifts that we can give to another human being. Hence,all our members are celebrating ‘Joy of Giving‘ this year by promoting listening through organizing various listening activities, contributing to, and taking an active part in a global effort to promote better listening habits around the world… thereby creating a more peaceful,open and harmonious global society. Join us in this noble work. To know more email us at : globallisteningcentre@gmail.com. Can we move beyond lip service on the art of listening in health care?